Parking lot striping is one of those obscure things that you never give much thought to during the day, but drivers every day rely on pavement markings when pulling into your parking lot to know where to park and which direction to go. Ensuring that you have a safe and freshly striped parking area will ensure the safety of your patrons to your Ft. Lauderdale business. We have been striping parking lots for many years and we know that using top quality traffic line paint, and updated equipment will ensure that your parking lot striping will turn out looking excellent. We take pride in using the best paint to give you the longest lasting striping to protect your investment in your parking area. When you stop to think of all the different pavement maintenance related items it can make your head spin. Never fear we are here to assist with every parking lot maintenance item you may have. Our professional crews have experience with every type of issue you may throw our way, and we are ready to assist. We are experts with both concrete and asphalt parking lots. We can do repairs on both, or simply do striping that you need. No matter the task, big or small we are ready to assist. We also work with your management staff to make sure we do not interrupt your normal business schedule or traffic. We will work within the confines of your schedule in order to come in and do the striping and maintenance. If it is necessary for us to work off-hours, we have crews ready and available to work within those times. Here are just a few of the top items with assist clients with on a daily basis. If you need a service that is not listed below for sure call us and I bet we will be able to assist you. We take compliance issues very serious. We know that if you are a business that is required to maintain proper fire lanes that you must stay in compliance or face getting fined by the local fire marshal. When you hire us to paint your fire lanes, you can rest assured that we will properly paint and stencil the lanes are required by law. Providing proper access for emergency vehicles, (Ambulance, Police, and Fire) is very important especially during the time of a crisis. 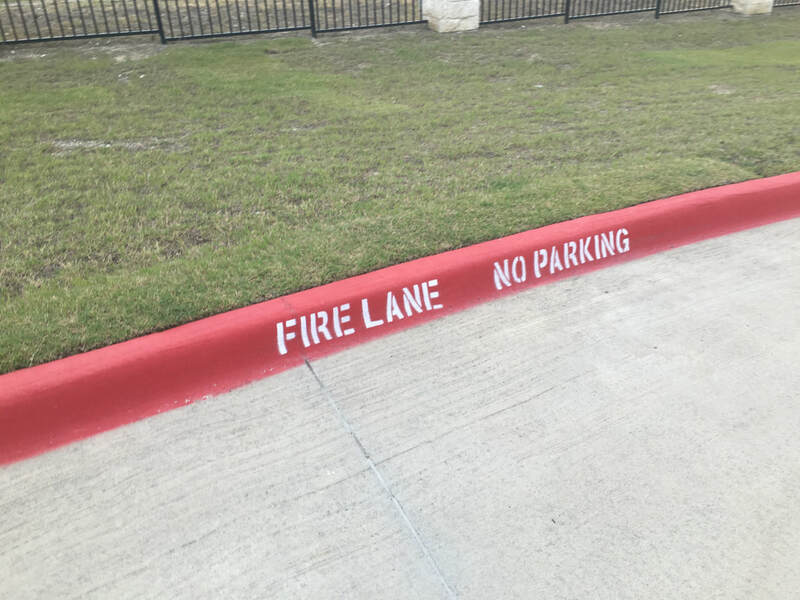 As with any safety feature in your parking lot, maintaining your fire lanes is extremely important. Our experts are ready to assist you, and ensure that your property is in compliance, and will pass any fire lane inspection that may occur. 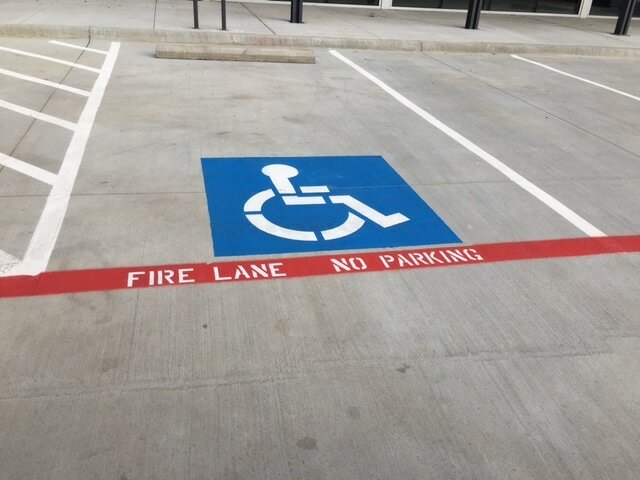 Contact us today for a free quote on striping your fire lanes. By now you are seeing that compliance and safety within your parking area are very important to us. We take striping serious as it provides safety for everyone that uses your parking lot. You have probably heard of the American Disabilities Act (ADA) which was put into place back in 1990 which requires that every business has mandatory handicap accessible parking spaces available to the patrons of your business. The size of your parking area dictates how many handicap parking stalls are required to be in your lot. This amount is based on the number of parking spaces you have in every 1,000 square feet of utilized parking space. There may be a requirement for you to also have van-accessible handicap parking, and this too is dictated based on the size of your parking lot. When was the last time you thought about speed bumps? It was most likely not that long ago and occurred while you were driving and had to slow down to drive over one. We love to hate them, but they do actually provide a specific purpose and that is safety. Think about it, if drivers slow down in your parking lot, there will be less chance of two vehicles colliding, and less chance for pedestrians to be struck. You will typically see speed bumps installed near crosswalks or long stretches of pavement where it would be easy for drivers to increase their speeds. Our professionals will make sure your speed bumps are easy to be seen so that drivers slow down before they hit them at a high rate of speed and cause major damage to their vehicles. Also, we want to make sure that pedestrians see the speed bumps and do not trip on them. It is kind of ironic how this safety feature can also turn into a hazard at the same time. Our expert line stripers are also experts when it comes to installing and removing concrete, asphalt, and rubber speed bumps. We are also great at restoring the current speed bumps you may have by painting them and to help maintain the longevity of their existence, as well as become highly visible to foot and driving traffic. We will be glad to speak with you regarding your speed bump needs. Wheel Stops are a safety feature used as in investment to protect your property. Used as a small barrier to prevent vehicles from rolling into buildings, walls, or other vehicles, wheel stops can inexpensively help save you from major damages. Wheel stops can also be uses as temporary, or inexpensive curbing placed around your property if needed. Wheel stops can be called by other names as well, such as car stops, or parking blocks, and no matter how you refer to them they all serve the same purpose of safety. Wheelstops are made from different materials, to serve different types of vehicles. Concrete and rubber wheel stops work exceptionally well for small cars and family type vehicles, but when used for parking lots that serve large trucks or semi-tractor trailers these types of wheelstops will break very easily. Steel wheel stops are a great choice if you cater to tractor trailers as these types of wheelstops are indestructible. Depending on your needs and budget, you can find a wheel stop that will fit best for your lot. We can help you pick the right type of car stops, and we also provide a professional and proper installation. Pro Tip: Wheel Stops although are a safety feature to help prevent damage, they can also be a tripping hazard for pedestrians if not placed properly. Car stops should never be placed in a walkway or a pedestrian path and should also be properly illuminated and painted to contrast their surroundings to help prevent tripping. We provide professional bollard installation service for your business. Most people know what bollards are, however many have no idea that they actually have a name. Bollards are the short posts designed to protect against vehicle intrusion. They can be designed and manufactured to withstand significant vehicle impacts, but they can also be used as visual barriers to direct traffic flow and to prevent access to restricted areas. When bollards are used to protect against vehicle intrusions they are made from construction grade steel and reinforced with concrete. These security bollards are ideal for building entrances, pedestrian areas, and exposed utilities, basically, anywhere that security is important you will find a need for bollards. Bollards can also be decorative ornamentation to any building landscape. They come in many stylish designs to compliment your building's surroundings and provide lighting and illumination for pathways, parking, and common areas. If you only need bollards due to ever changing access needs or parking requirements, you can go with a removable or retractable type bollard. These are less for security, due to the fact that they are removable, but used mostly as a visual traffic barrier to keep the traffic moving in a proper direction. Our professional crew can install all types of bollards and will be glad to discuss your bollard needs. 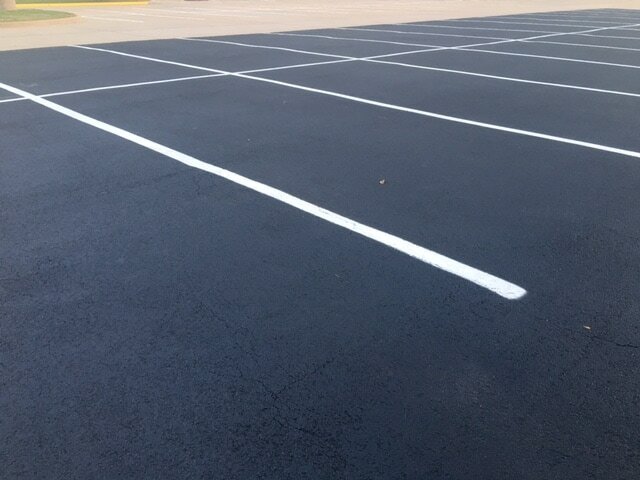 If you have an asphalt parking lot, you will need to maintain the asphalt by applying a sealcoat every 1-3 years. The seal coat is a barrier that is placed on top of the pavement. It will help weatherproof the surface, as well as seal in small cracks. When vehicles turn their wheels it will cause the asphalt to deteriorate over time. If you have a sealcoat on top of the asphalt, all of the wheel turnings will actually deteriorate the seal coat leaving the actual asphalt unharmed. Sealcoating is an extra added bit of protection for your pavement, protecting your initial investment. Proper maintenance of your asphalt parking lot will make the surface last a very long time. If your asphalt has been neglected for long periods of time, then a sealcoat may be a little too late, and will not help you at all. 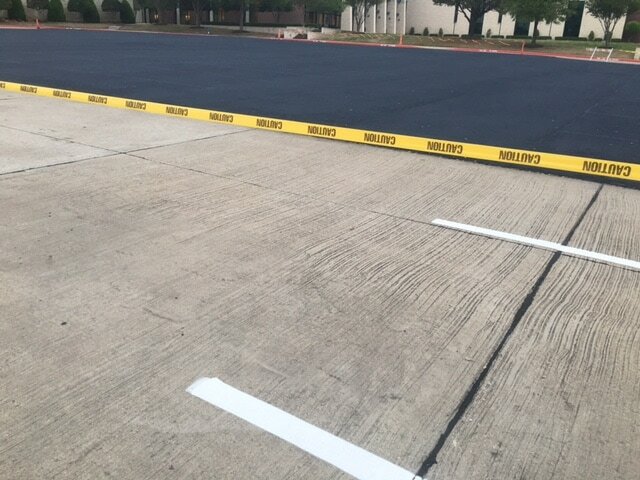 Once we come out to see the condition of your asphalt, we will let you know if a sealcoat will be beneficial to your parking lot or not. The good news is that once you add a sealcoating to your parking lot, it will make your asphalt parking lot look brand new. The deep dark black sealcoating will look great, and the fresh striping on top of the sealcoat will really pop and look very nice. You will love the look and overall appearance of your parking lot after a fresh sealcoat and striping. ​We love servicing local businesses for all of your pavement maintenance needs. We strive to not only come in, stripe your parking lot and leave, we want to partner with you and become your pavement maintenance company for life. We know that when you keep up with the maintenance on your parking lot you can help prolong its life, and keep it looking beautiful for many years longer than if it goes neglected. We work with many different types of businesses, and we look forward to serving you too. If you have a parking lot, warehouse area, or sports field we can assist you with painting stripes that you need. If your business type is not listed here, do not worry we can still assist you. ​We understand that getting a great price on any product or service is important to the bottom line of your business. We offer the most competitive pricing for striping services throughout all of the Ft. Lauderdale area, which will be easy to fit within your budget. We also offer FREE quotes and will schedule a time to come out and properly estimate the work that you need to have completed on your property. When you are ready to get started on your project, give us a call to discuss the details. We look forward to servicing you and your business. ​Pompano, Pompano Beach, Sunrise, Tamarac, Weston, and the surrounding areas.